Destinations : Delhi, Agra, Bagdogra, Darjeeling, Mirik, Pemayangtse, Gangtok, Pheuntsoling, Thimphu, Punakha, Paro, Delhi. On arrival, you will be met by our representative & transferred to the hotel. Rest of the day at leisure. Overnight at hotel. Early morning drive to Agra.Enroute visit the world famous Taj Mahal, Red Fort, Itmad-ud-Daula's Tomb and shop. Overnight stay at hotel in Delhi. In the morning you will be transferred to the airport to catch a flight to Bagdogra.On arrival transfer to the hotel in Darjeeling. Rest of the day at leisure. Overnight at hotel. Full day excursion to Mirik. In the evening, drive back to hotel. Overnight at hotel. Spend the day touring at the beautiful hill station of Darjeeling. Visit the main tourist places including the Tiger Hill, Ghoom Monastery, Observatory Hill, Zoological Park, Natural History Museum, Himalayan Mountaineering Institute, Passenger Rope Way, Tibetan Refugee self help center and Tea Plantation. Overnight at the hotel. On this India cultural tour, visit the Pemayangtse monastery. On arrival, check into hotel. Afternoon visit Yuksom Monastery. Overnight at hotel. Morning drive to Gangtok. On arrival check in at the hotel. Take a short tour of Gangtok; visit the Namgyal Institute, Do Drul Chorten, Orchid Sanctuary, Tashi Ling, Tsuk la Khang and Enchey Monastery. Overnight at the hotel. Full day excursion to Rumtek Monastery. In the evening, drive back to Gangtok. Overnight at hotel. Afternoon an excursion to Phudong Monastery. Overnight at hotel. Morning drive to Pheuntsoling. On arrival check into hotel. Evening visit Pheuntsoling market and town. Overnight at the hotel. Drive to Thimpu. Today you will experience the scenic beauty of Bhutan. Lunch midway at a cafeteria & proceed to Thimphu. On arrival & check in into hotel. Overnight at hotel. Whole Day sightseeing in Thimphu includes the memorial Chorten painting school, Gold & Silver Smith, the National Library, Dechencholing Palace, Handicraft center. Overnight at hotel. Drive to Dochula Pass, situated at a distance of 3055 meters. While on tour to Thimpu, you can have a magnificent view of the Eastern Himalayas. Then drop down to 1400 mts into Wangdi Valley. Arrive Punakha, ancient capital of Bhutan. Afternoon visit Punakha Dzong and local bazaar. Overnight at hotel. Drive to Paro. On arrival, here you can have your lunch. Enroute visit Semtokha Dzong, the oldest Dzong in Bhutan. 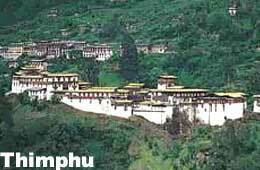 Visit Dungtse and Kyichu temples in Paro. After lunch visit the national museum and the Pari Dzong. In the evening, stroll around the local bazaar in Paro. Overnight at hotel. Paro is a beautiful place with many religious & historical interests. Drive to Taktsang, or the Tiger's Nest, this monastery is one of the most sacred pilgrim sites for Bhutanese. This is one of the main highlights of this tour. Overnight at hotel. Transfer to Airport to board your flight to Delhi. On arrival transfer to hotel. Afternoon free to relax Overnight at hotel. You can cover a half-day city tour covering India Gate, President's house, Humayun's Tomb, Qutub Minar and Laxmi Narayan temple. After lunch we will take you to Old Delhi where you will see Jama Masjid, Red Fort, Gandhi Memorial followed by sound & light show at Red Fort. Transfer to International airport for flight to onward destination. India Profile offers online information and booking for India Cultural Tour - An Enchanted Realm, India. For more information or to book your tour, please fill up the form given.